Naturally, the police come into contact with people from all walks of life when they are investigating crimes, reports of crimes and interviewing people. And equally naturally, many of these people will speak a different language. But while it cannot and should not be expected that police officers should speak any language other than the one spoken in the country where they work, sign language does pose a problem all of its own. While most foreigners and immigrants who do not speak English could at least get a message across or perhaps call someone who could do so on their behalf, it is far more difficult for a deaf person. Therefore, it can be suggested that some forces should take a slightly different approach to sign language, as there are many occasions when being able to ‘speak’ even just a few words of sign language would help officers and victims. Few people can actually enjoy enforced courses for work, but the feedback from many police forces which have tried a sign language course is positive, as soon as officers start to learn sign language, they can see the numerous manifold benefits of having a police force able to communicate with people who may well have been marginalised because of their disability any way. 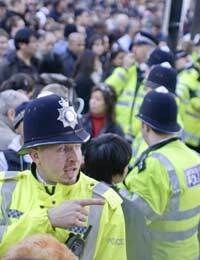 And although there are plenty of sign language interpreters to assist deaf people in interviews and in court, the problem arises when officers are called to an incident and find themselves unable to converse with a person who needs them. Therefore, even a short course allows officers to learn some very basic skills to at least be able to ask and answer some very basic questions. British Sign Language tutors have delivered several day-long courses over a series of weeks to some police forces, where as many as 40 members of staff learn basics such as the alphabet and how to say their name. As well as making it possible for the officer to then elicit vital information from someone who speaks sign language, knowing that there is someone with them who knows even a tiny bit of sign language will put people, especially victims of crime, at ease at least a little. Other people even learn a small amount in an hour-long lesson. Other forces have taken a more ad hoc approach to learning sign language. In Sheffield, a community support officer met a teenager with Downs Syndrome who used sign language and asked him to deliver lessons to staff at the local police station. The officer in question decided to invite the teenager along to the station after meeting him and realising they could not even ask his name because they did not have the necessary language skills. By asking him to deliver some lessons, they have gone some way to rectifying the situation, in their own station at least. The police, as with other emergency services, have to be able to communicate with all sorts of people. And people who cannot share their language due to a disability must be top of that list. In today’s society, there are all manner of laws and rules which state that public services must be accessible to all, but it is still warming to see how many forces are developing their own initiatives to improve their services to deaf people even further.